Greetings in the name of our Lord and Savior, Jesus Christ! One of the truly gratifying things of being part of a Full Communion relationship with fellow Traditional Anglicans is the love and support shared by the Members. The recent Hurricane Florence which landed in coastal North Carolina affected areas far beyond the coastal regions of both North and South Carolina. The flood waters from the Hurricane swelled the rivers reaching well into half-way across the two States. Our Church of All Saints, Wilmington, N.C. sustained damage which could have been far worse. You can see the pictures and read about the event on our APA website, anglicanprovince.org. Within a day, telephone calls went out from our G4 Communion partners asking how could they help. Fundraising began in order to assist those who were in need of help. The Anglican Church in America (ACA) has offered their International Anglican Fellowship (IAF) to help by being the repository and distribution arm of the G4. Last year, when Hurricane Maria hit Puerto Rico, devastating our Communion Partners there, the response from the G4 member Churches was generous giving all of the funds collected at the G4 Synods in Atlanta 2017 to the Hurricane assistance in Puerto Rico. With the recent hurricanes in the Southeast, I am reminded, that when I mention the APA website while visiting congregations, how many of our people in the parishes seem to be completely unaware of the fact that we have a website. Most of our members have a computer and can access the internet and get important news of our APA and beyond on our website. Our webmaster, Archdeacon Erich Zwingert, works hard to keep our website up to date so we can get the latest information about what is going on in the life of our Church. Our Winter Conference, which has become a tradition in the APA, will be held next year in Fernandina Beach, Florida, hosted by Holy Trinity Church and Rector Fr. Brad Cunningham. We are looking forward to this opportunity to gather in Christ’s Name to share fellowship, to learn from each other, and to support one another in the work we are doing for God’s Kingdom. The Theme of this year’s Conference will be “Missions in the Local Church.” We hope that the information shared during the presentations and discussions will be ideas that can be taken home and replicated in each local situation. The hotel will be the Hampton Inn Amelia Island, Historic harbor. The hotel is located in downtown Fernandina Beach, across the street from the marina and within a very short walk of dozens of excellent restaurants and shops. Please see the last page of this Epistle for a detailed schedule. Online registration via our APA website will be available soon. Looking forward to a great time together. The dates are set and plans are made for the biennial Synod of the DOW, which will be held in Wilsonville, Oregon (Portland). The Synod is being hosted by St. Michael’s Anglican Church where Vicar General Robert Hawkins is Rector. The preliminary start will be with the Standing Committee meeting on Friday evening, November 2, at the Church, with Synod proper beginning Saturday morning after Morning Prayer. Holy Communion and Confirmation will be celebrated that Sunday, followed by a potluck lunch before attendees depart. Following the death of Canon Raymond Unterburger earlier this year, the Vestry, with my guidance, has established a Search Committee for a new Rector for the Parish. Mr. Charles (Charlie) Manship has agreed to serve as the Chairman of this Committee. The qualifications and priorities of St. Paul’s rector candidates have been established by the Search Committee and are available to interested candidates. If interested please contact the Bishop’s Office at 407-657-0880 or apadeus@cfl.rr.com. St. Paul’s Church is a vital parish in the APA/DEUS with many possibilities for growth in the Melbourne, Florida area. They are looking for a priest who will bring enthusiastic leadership and energy to the parish which is anxious to fulfill its mission in God’s Kingdom. The Setting Apart of a Deaconess at All Saints’ Church, Mills River, N.C.
On Sunday, October 7, 2018, Cynthia Ingram Hensley was Set Apart as a Deaconess in the APA/DEUS at the 11:00am Eucharist. She was presented to me, as Presiding and Diocesan Bishop, by Archdeacon Erich Zwingert, Rector, along with a large and enthusiastic congregation present. A number of churches from the Deanery were represented at the Mass including three Deaconesses of our Church: Tina Jenkins, Debra Kidd and Claire Burgess. As part of the Deaconess uniform, Cynthia was vested with a silver crucifix provided by the All Saints’ Church and was then assisted by the attending Deaconesses with the standard APA blue blazer symbolic of the Office. It was a day of great celebration at All Saints’ Church and the DEUS. After a long and hard fought battle with the detractors in the neighborhood where the School is to be built, the day had finally come for the ceremonial “ground-breaking” for the School. Lindisfarne Hall, which began on a small scale a few years ago, will now have a permanent home where young people can learn and received an education in Classical, Christian and Anglican tradition. The School began in the Parish Hall of Holy Trinity Church, but in time to come will be able to expand its ability to accommodate many more students. The Rector, Fr. Brad Cunningham, and his assistants, along with the congregation, has maintained its focus and determination against the legal battles and has won by the Grace of God. What a great day of celebration for Holy Trinity and all of us as part of the Anglican Province of America. Plans are being made for the G4 Jurisdictions to meet with the Union of Scranton Churches, the Polish National Catholic Church (PNCC) and the Nordic Catholic Church, in Atlanta, January 15-17, 2019. The Union of Scranton Churches wish to meet to begin dialogue with the G4 working toward an Intercommunion Agreement. There has long been a wish on the part of the PNCC to re-establish a relationship with Traditional Anglicans since the break with the Episcopal Church occurred over Women’s Ordination in the 1970s. Their proposal would be a non-threatening Agreement of Communion whereby each jurisdiction would continue to operate under its own Constitution and Canons. The Proposed Meeting is planned to be at St. Barnabas’ Anglican Church, Dunwoody (Atlanta), GA.
A number of our people have indicated an interest in going on this unique pilgrimage being led by two of our experienced Clergy to Holy Land, Bishop Chad Jones and Father John Klein. Time is running out as we get close to the deadline for registering (November 30, 2018). This will be an experience of a lifetime to which Mary and I are truly looking forward. I was there in 1976 and still remember it so well, and many new archeological discoveries have been made since the then. This pilgrimage will be focused on being a genuine spiritual Anglican experience as we will be able to celebrate Mass at a number of the Holy Sites. There is an article on the APA website along with the registration instructions. Come join us! St. Peter’s Church, Waynesville, North Carolina, has requested to close as of October 28, 2018. Fr. Michael Bolt, who served as Vicar, is retiring from his secular job and is moving to eastern North Carolina to be closer to relatives. The Mission was small and Fr. Bolt and the congregation did not believe they were viable under the circumstances to continue. This is a reminder to all non-parochial clergy that you are required to send your Diocesan Bishop (or Vicar General for DOW) a letter at least once a year. Advent Season is preferred which is almost upon us. This will satisfy Canon 43, Section 1 of the APA Canons which reads in part: “And every Minister not in charge of any Parish or Congregation shall also report his occasional services, and if there have been none, the causes or reasons which have prevented the same.” Please send me a letter or email during this Advent Season. (Assistants and Curates are exempt because the Annual report from the Rector/Vicar includes all his subordinate clergy). I would enjoy and appreciate hearing from our clergy. Unfortunately, those non-parochial clergy who fail to contact me will ultimately be dropped from the APA roles. Retired Clergy, although you are not required to write annually, I would enjoy hearing from you to see how you are doing. As we come close to the end of our Christian Year and begin the Advent Season, we have so much for which to be thankful. God has truly blessed our Province and Dioceses with many wonderful and dedicated clergy who take the mission and vision of our Church very seriously. More and more our parishes and missions are becoming involved in the greater Mission of the Church outside the four walls of the local church. The New Year will bring a time of decision as the DEUS will be voting to elect a Bishop Coadjutor at their Diocesan Synod. It is important that this be done prayerfully as we consider the future direction of the Diocese. The APA has continued to grow, although slower than we wish, and stability has been a key factor in this. We are part of a larger Full Communion fellowship which we refer to as the G4 which allows us to transfer clergy and cooperate with our fellow Anglicans. The APA has always been cautious in its approach, wishing to be ecumenical but hesitating to give up on its autonomy until full confidence and trust is established before making another move. We have maintained as a Body a strong vision of Mission rather than being content on simply being maintenance-minded. Without this Vision for the future, we run the danger of simply fading away. Some of our very small mission churches have had to close this year due to loss of a clergyman and diminishing membership. As we plan mission churches in the future, strong consideration must be given to demographics, suitable location and ability to provide an effective priest. We learn often by trial and error, but we must learn. God bless each of you as we anticipate a great new year in the Lord’s work and building his Kingdom is this world that desperately needs His Grace. The Diocese of the Eastern United States, APA, will hold its Diocesan Synod in Orlando/Oviedo, Florida, the week of July 15, 2019. As mentioned previously, this Synod will include the election of a Diocesan Bishop Coadjutor. Please mark your calendars. Reminder: all DEUS clergy are required to attend unless excused by Bishop Grundorf. DEUS: The Rev. Mr. Mark Perkins was ordained to the Diaconate on August 18, 2018, at All Saints Church, Charlottesville, VA, by the Rt. Rev. Chandler Jones. Deacon Perkins will serve as Curate at All Saints. DEUS: Cynthia Hensley was set apart as a Deaconess on October 7, 2018, at All Saints, Mills River, NC, by the Most Rev. Walter H. Grundorf. Dss. Hensley is assigned to serve at All Saints Church, Mills River, NC. Haiti: The Rev. Mr. Rosemond Etienne will be ordained to the Sacred Order of Priests on October 28, 2018, by the Rt. Rev. David Haines. Fr. Etienne will serve at various churches in Haiti. Haiti: The Rev. Mr. Pierre Nacius will be ordained to the Sacred Order of Priests on October 28, 2018, by the Rt. Rev. David Haines. Fr. Nacius will serve at various churches in Haiti. Haiti: The Rev. Mr. Yvon Thermidor will be ordained to the Sacred Order of Priests on October 28, 2018, by the Rt. Rev. David Haines. Fr. Thermidor will serve at various churches in Haiti. Haiti: The Rev. Mr. Wilfrid Ulysse will be ordained to the Sacred Order of Priests on October 28, 2018, by the Rt. Rev. David Haines. Fr. Ulysse will serve at various churches in Haiti. Haiti: Mr. Steevens Morency will be ordained to the Diaconate on October 28, 2018, by the Rt. Rev. David Haines. Deacon Morency will serve throughout Haiti. DEUS: The Rev. Canon R. Larry Emerson was appointed Vicar Emeritus of All Souls Church, Asheboro, NC, on October 20, 2018, by the Most Rev. Walter H. Grundorf. DEUS: The Rev. Michael Bolt will retire as Vicar of St. Peter’s Mission, Waynesville, NC, on October 28, 2018. Fr. Menees; Canon Emerson and wife, Shirley; Fr. John Gibson; Bishop Rushlow; Bishop Hanlan and wife, Joan; Fr. Sweeney; Bishop Shaver; Fr. Conway; Fr. Carter; Fr. Bakley and wife, Pat; and Fr. Gardner. Oct. 7-8: Setting Apart of Deaconess Cynthia Hensley and Episcopal visitation, All Saints, Mills River, NC. Oct. 13-14: Groundbreaking of School and dedication of Sacristy, Holy Trinity, Fernandina Beach, FL. Oct. 20-22: Appointment of Vicar Emeritus to Fr. Larry Emerson, Episcopal visitation, All Souls, Asheboro, NC. Oct. 25-27: Visiting Bishop and Carol Shaver, Merrillville, IN. Oct. 28: Preaching, Holy Trinity (REC), Webster Groves, MO. Nov. 2-4: DOW Synod, St. Michael’s, Wilsonville, OR. Nov. 9-11: Bp Myers event at St. Alban’s Cathedral, Oviedo, FL. Nov. 12: Touring DEUS Synod hotel, Oviedo, FL. Nov. 18: Annual meeting St. Alban’s Cathedral, Oviedo, FL. Nov. 20-26: Family vacation (rescheduled). Dec. 2-9: Out of connectivity – cruise with family. Oct. 20: Attend Reception for Fr. Larry Emerson, All Souls Church, Asheboro, NC. Oct. 26-30: Episcopal Visitation, Ordinations and Confirmations, St. Yves Church, St. Francis of Assisi Church, Cap Haitian, Haiti. Nov. 3: Special Board Meeting, St. Andrew’s Theological College and Seminary, St. John’s Church, Greensboro, NC. Nov. 16: Deanery Meeting, Deanery of Central and Eastern Carolinas, St. Michael’s Church, Charlotte, NC. 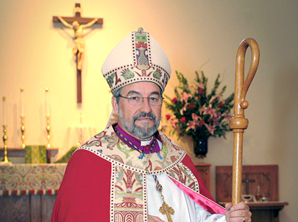 Dec. 9: Episcopal visitation, All Saints, Prescott, AZ. Oct. 10-12: Bishops’ Meeting of the Anglican Joint Synods, Saint Mary’s Church (ACC), Denver, CO.
Oct. 27: Retreat Conductor, Anglican Joint Synods Men’s Retreat, Saint Thomas the Apostle Church, Alto, GA.
Nov. 1-3: Retreat Conductor, DEUS/APA Women’s Retreat, Monastery of Our Lady of the Holy Spirit, Conyers, GA.
Dec. 7-9: Anglican Joint Synods social gathering and study on the Nicene Creed with Bishop Kenneth Myers, Saint Barnabas Church, Dunwoody, GA.
Dec. 15-16: Episcopal Visitation, Saint Philip’s Church, Blacksburg, VA.
Oct. 09: Southeast Florida Traditional Anglican Clericus, Boca Raton, FL. Oct. 28: Episcopal visitation to St. Peter’s Church, Deerfield Beach, FL. Nov. 13: Southeast Florida Traditional Anglican Clericus, Boca Raton, FL. Dec. 09: Episcopal visitation to St. James of Jerusalem Church, Sarasota, FL. Dec. 11: Southeast Florida Traditional Anglican Clericus, Boca Raton, FL. 30 Rev. Canon Robert Cheeseman, USAF, Ret.